Each of our rooms is spacious and elegantly furnished in its own individual style. All rooms are well equipped - a list of the items provided in each room is shown on the Your Stay page. 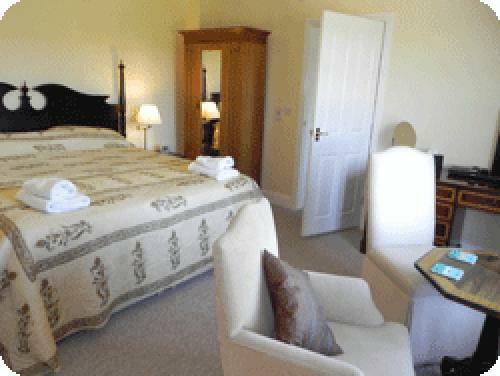 Each room has an en-suite bathroom, with either bath and/or shower. Free wireless internet access is also available in each room. A description of each room is shown below. Our ground floor rooms are perfect for guests who find stairs difficult. 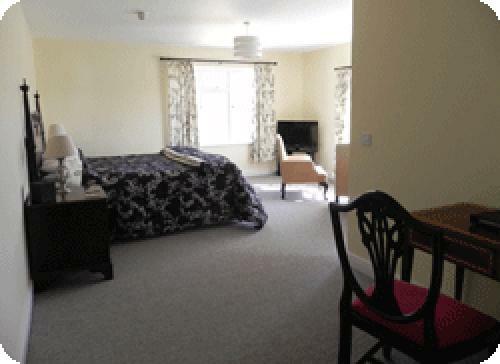 All our rooms are on either the ground or first floor;we have no attic rooms. A spacious and comfortable room with 2 luxurious sofas and a range of armchairs;comfortable seating for 8 or more. The lounge is equipped with a large flat-screen TV and a DVD library. The room also has separate table with a WiFi-enabled computer for guest use. 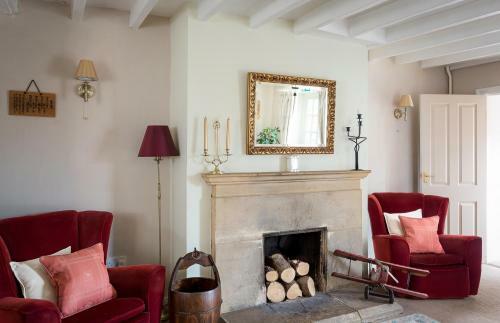 During the winter there is often a roaring log fire in the Cotswold stone fireplace. Our very spacious dining room was converted from part of our stable block in 2012. It is linked to the house by a glass-walled corridor and is a bright room with windows facing towards the Cotswold hills to the southeast (making it especially bright at breakfast time) and onto the stable courtyard. 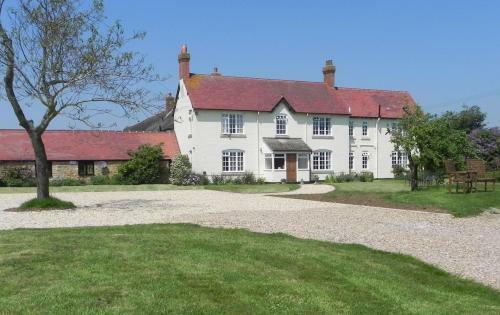 It features exposed oak trusses and Cotswold stone walls. The room is furnished with individual dining tables which can be arranged together for larger groups. Along one wall is a dresser which accommodates the extensive buffet-style portion of the Lowerfield breakfast menu. At one end of the Dining Room we have an honesty bar stocked with chilled beers, wines and soft drinks, a range of other wines, bitters and ciders, and a variety of spirits and fortified wines. Despite the suggestion of its name, this is a bright and airy room. It is large with a king size double bed which can also be a twin. Dark Coppice looks out on the garden and lawn to the front of the house. Ensuite with spacious shower. With a feature Cotswold stone wall and fireplace, this spacious room has a super king size leather sleigh bed and an ensuite with walk-in shower. The room is in the Victorian part of the house, and looks out over the garden towards the Cotswold Hills. Prior to conversion, this was our dining room. A very comfortable room located in the old part of the house. 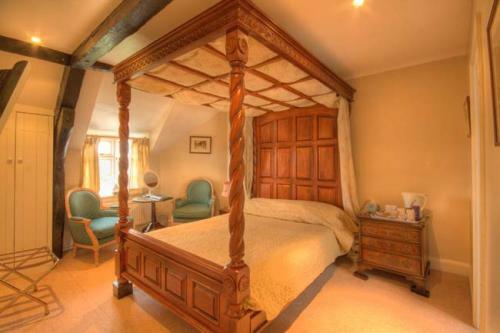 Though not our largest room, Milkup has a beautiful king-size mahogany four-poster bed and two limed oak reading chairs positioned to look out over the stable courtyard to wards Bredon Hill. A generous beamed bathroom with en-suite bath and a separate shower cubicle. Extras with this room include fluffy toweling robes, bottled spring water and bath sheets. A large room positioned perfectly at the front of the house with a view across the gardens and towards the Cotswold escarpment and Broadway Tower. It is in the Victorian part of the house and has a king-size double sleigh bed, large dressing table, and a table and chairs by the window to take in the view. Space for additional beds for a family. Ensuite bath with shower over. Features a super king-size double which can be converted to twin beds. From the beautiful desk positioned at the window the view also looks out over the gardens and towards the Cotswold escarpment. Has an ensuite shower room with spacious shower. Our largest room with a superb view towards the escarpment and Broadway Tower and to the northeast across the paddocks and fields towards Meon Hill. It has a king size double bed and a day bed which can be used as a large sofa or to convert to a full sized single bed. Space for an additional single put-up bed for a family. A good sized ensuite with generous shower. 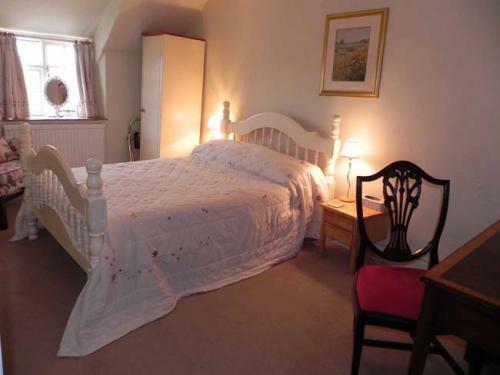 An attractively furnished period room with a wrought iron king size bed. It is in the 17th century part of the house with black oak beams but has a modern and elegant en-suite with bath and built-in shower over. Looks across the stable courtyard and over fields, towards Bredon Hill in the south. Also in the 17th century part of the house, with a regular double sized bed we often use this room for single occupancy, though it also makes a comfortable double room. Has a large en-suite with shower. Intrigued by our room names? They are named after local features. Come and explore!